Chatham Park received it's master plan approval in June 2014 and is moving forward with the first buildings, UNC Medical Offices and Hospital, aiming for an ambitious opening in the fall of 2015. Chatham Park is a master planned development of mixed-use commercial and residential, on over 7,000 acres, located near the intersection of Hwy 64 and 15/501 in Pittsboro, NC. "Chatham Park is envisioned as a comprehensive live-work-play community that will preserve open space, create parks, establish vibrant village centers as focal points for work, entertainment, shopping, dining and recreation and create attractive connections among neighborhoods, businesses, schools and parks, both inside and outside Chatham Park. Chatham Park recognizes the intrinsic value and character of historic Pittsboro and its downtown and will stay connected to this area, to this character, because this connection offers a sense of community that cannot be replaced and must be preserved. Chatham Park will offer residents the opportunity to walk, bike or drive short distances to work, send their children to nearby schools, and socialize at shops, recreation centers, libraries or parks. Chatham Park is located adjacent to Haw River and Jordan Lake, which have over 45,000 acres of preserved parkland and natural areas. An extensive network of trails in Chatham Park will connect every resident to these outstanding natural and recreational areas, as well as to historic downtown Pittsboro through the Town's trail network. Chatham Park is envisioned as having five villages. In combination with the historic downtown, these will serve as activity centers for the region. Creeks and stream valleys will serve as natural buffers between neighborhoods and as trail connection points connecting neighborhoods of distinct personalities. In addition to the integration of the built and natural settings, Chatham Park’s master plan proposes a regional mixed use center to offer residents and workers every convenience: shopping, dining, education, recreation and housing will be integrated into a rewarding urbane place. As envisioned, Chatham Park will provide essential retail, services and housing into the future without the need to sprawl beyond the Town’s service limits. Also, a wide variety of housing choices will be provided. In accordance with the vision, Chatham Park has formed a partnership with the Research Triangle Region’s Cleantech Cluster whose goal is to strengthen the region’s position as an international hub for technologies that enhance resource conservation, community operating efficiency, convenience of life, and sustainability. Chatham Park’s “Chatham Technology Corridor”, with two major highways conveniently connecting it to all parts of the region, provides the region with a new focal point for the expansion of its high quality knowledge workforce. However, this time new jobs will be situated in the same community as the homes of the employees and their families. 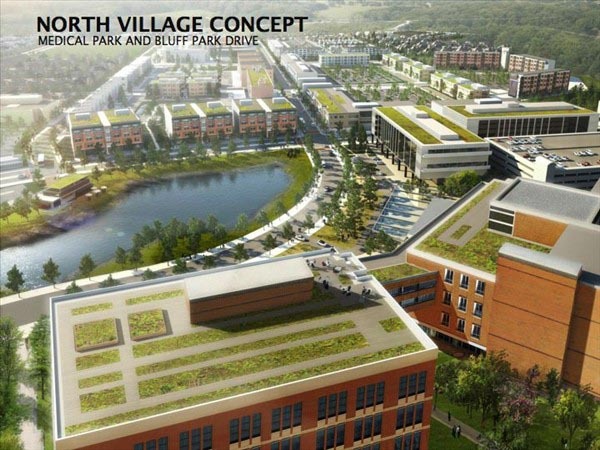 The development of Chatham Park will evolve in distinct phases, starting with North Village. The gradual unfolding of the development ensures a comfortable pace of organic growth in the community and allows Chatham Park dynamic and flexible growth for many years to come. It will also allow opportunities for residents to move to different neighborhoods as their needs change without having to leave their community and friends behind. Chatham Park, in partnership with Pittsboro, is envisioned as the place where you can live, work, play, enjoy, and continue to be inspired for years to come." To view the document in its entirety, please see the Chatham Park Planned Development District Master Plan, approved December 2014 on the Pittsboro NC website.